The esri-loader library hit the 2.0.0 milestone this week. This release doesn’t add any features, but merely removes the old callback APIs that were deprecated when we introduced the promise-based ones in v1.5.0. If you’ve been using the new APIs, you can save yourself a few bytes by upgrading to 2.0.0. You can read more in the 2.0.0 release notes. 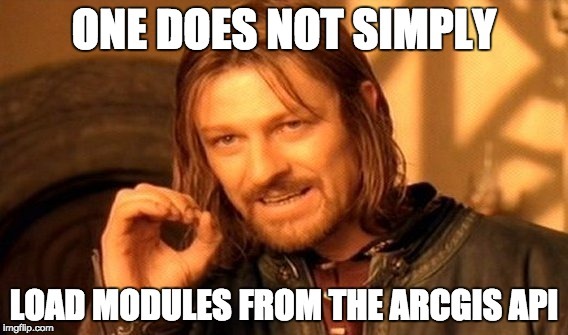 If your ArcGIS web application uses any other module loader besides the Dojo loader (i.e. webpack, Rollup.js, etc. ), you should be using esri-loader. That’s a bold statement, so let me back it up. 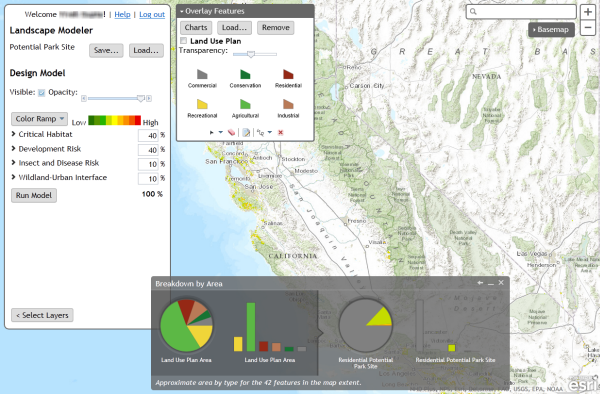 I’m excited to see support for ArcGIS image services landing in Esri Leaflet Beta 6. 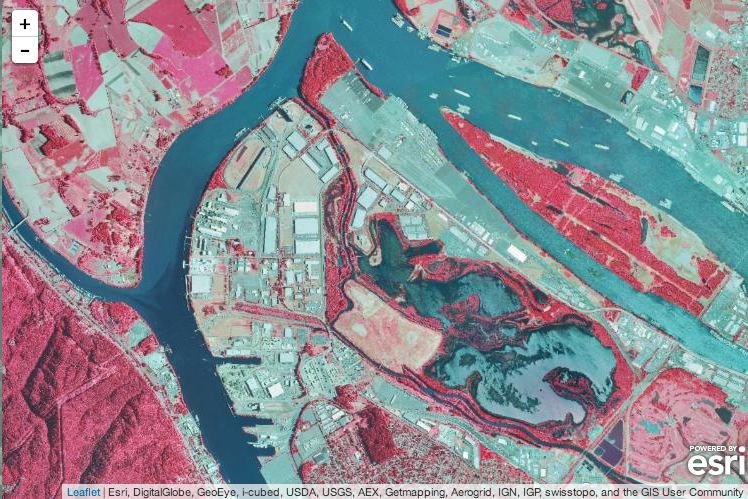 In addition to serving up raster data such as imagery and digital elevation models, image services provide powerful analytical capabilities. Now Leafelt users can visualize infrared imagery and LiDAR data, get the elevation where a user clicks, and much more. I’m looking forward to seeing how the Leaflet community brings these new capabilities into their applications. Recently I’ve been developing custom widgets for the ArcGIS Web AppBuilder, and I have found that there is a lot of boilerplate code that you have to create for each new widget. 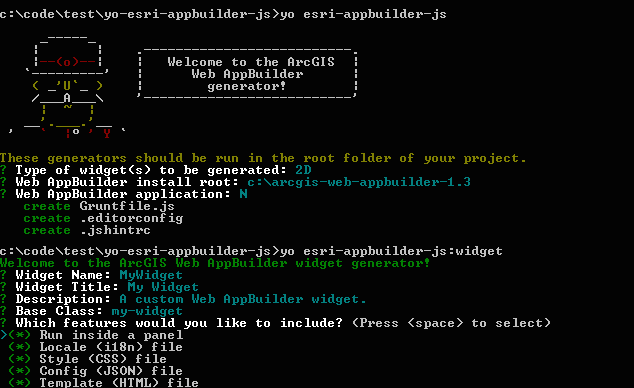 I thought that a Yeoman generator would be a useful way to scaffold out the widget files, so I created generator-esri-appbuilder-js. The package contains a couple of generators that walk users through a series of prompts to gather information about a custom widget that they want to develop for the Web AppBuilder, and then scaffolds out the widget’s files. The generator prompts you for widget properties and then scaffolds out the required files. Now you can choose whether you’d like to get started using Bootstrap with jQuery or Dojo. The video, slides (PDF), and links to related resources from that talk are all now available at the GitHub repository we created for the talk. Beyond that, if you’re interested in the mechanics of testing mapping apps with any of the frameworks we cover (the Intern, Jasmine, Karma, etc) there are plenty of resources to get you going. This week the Landscape Modeler application that was previewed at the International User Conference in June has hit the ArcGIS Marketplace. Landscape Modeler is a web application that allows users to perform fast weighted overlay analysis at multiple scales or over a large area. This is ideal when there are multiple users that want to develop their ideas about suitability analysis models and share their results with each other. You can find out more about Landscape Modeler listing on ArcGIS Marketplace (don’t worry, it’s free to any user with an ArcGIS Online organizational account). However, I wanted to mention a few things that I find interesting about this application from a developer’s perspective. The app will be released in the coming weeks, so stay tuned. For the better part of my first year at Esri, I have been working on a web application for the Community Maps Program that would make it easier for program contributors to upload and manage their data contributions. We released a minimally viable version of the web application in the fall of 2012 which focused on letting users register for the program and upload data. Since then we have focused on creating an application that lets users manage the complete lifecycle of their contributions from upload, through data review, map cache generation, and finally incorporation into the Esri basemaps. This version came out of beta at the beginning of this month. The application is for program participants only, but if you are interested in learning more about or contributing to the program you can learn more by visiting the ArcGIS Online features page for Community Maps. CairnBUILDER is was an interactive mapping application that enables users to draw trails and markers over a topographic map service. CairnBUILDER is was a collaboration between Brian Sims and I and our entry into the ESRI 2010 Mashup Contest.